This breakwater project at the westernmost end of Willoughby Spit was the first of several projects in Norfolk that are part of the City's long-term strategic plan along a dynamic Chesapeake Bay shore front. 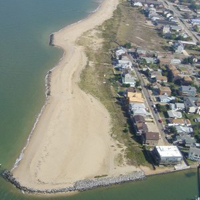 A fetch exposure to north of over 80 miles and a significant ocean wave component during storms leads to a high rate of sand transport toward the west along Norfolk's Chesapeake Bay shore. At the terminus of Willoughby Spit, sand moves over the terminal groin. Two headland breakwaters were constructed in 1988 to halt the transport of sand off City property. Over time, the breakwater systems completely fill with sand which is dug out and recycled updrift to eroding sections of the shore.